A full-size van with room for up to 15 and multiple payload/powertrain choices, the GMC Savana deftly matches civility with capability. The 2013 gmc savana 3500 passenger electric vehicle qualifies for a federal tax credit of up to $7,500, effectively reducing the net base price. Delivery services and airport shuttles and contracting businesses understand there is nothing more capable and versatile than a big box on wheels. But so will a family with kids and dogs and dirt bikes to carry around. The 2013 GMC Savana has the size and strength to do the duty, and it also rides and drives with a smoothness and civility that may surprise you. It shares lots of basic hardware with GM's well-engineered full-size pickup trucks, and has a model lineup nearly as extensive: 1500, 2500 and 3500 Series (distinguished by payload capacity); 135- and 155-inch wheelbases; LS and LT trim levels; a V6 and five V8s; rear- or all-wheel drive... you can have it your way. Don't plan to use it as a daily commuter, but when you need to accommodate lots of people or stuff, and you want it all safely contained inside, there is simply nothing like a big van. The GMC Savana drives easily and doesn't cost a lot. Unless you're actually going to use the available hauling capability on a regular basis, a vehicle of this size (and carbon footprint) makes no sense. If it's not for you, you likely know that already. The Yukon or a similar large SUV could be a good alternative. For 2013, the GMC Savana, in both Passenger and Cargo Van forms, just adds three new options: a rearview camera, sonar-based parking assist and an audio system that includes navigation. Like GMC's other full-size, body-on-frame vehicles with which it shares engineering (the Sierra pickup and Yukon SUV), the 2013 Savana's ride and handling characteristics may come as a welcome surprise. You won't confuse this big van with a sports car, but steering and braking are nicely responsive and everything feels refined and reassuring. It's best to look well up the road and plan ahead, since vehicles this large need time and room to react. But driving the Savana is easy, and the high seating position and (in Passenger versions) the all-around window glass provide a great view out. You want to have one of the Savana's available V8 engines under the hood, as the base V6 is not suitable for anything beyond light-duty work. Lots of choices here: The standard passenger-side double swing-out doors can be replaced by a sliding door, there's a GM-exclusive swing-out-doors arrangement available on the driver's side, and lift-up panels can provide access to side storage bins. Few vehicles can offer the versatility of 15-passenger seating, a tow rating of 9,900 pounds, and a cargo area measuring 284 cubic feet behind the front seats. And the view out over traffic is terrific. The dash and door panels are pretty plain, but they are functional and sturdy as required of a passenger van's interior. Gauges in the instrument panel are large and easy to read, and the heating controls and radio are in reasonable reach for the driver. In Cargo Van form, the 2013 GMC Savana is a 2-passenger vehicle with the world's largest trunk. At the opposite end of the spectrum is the Savana Passenger Van that allows for such luxuries as bench seating, power windows, rear air conditioning and Bluetooth hands-free phone connectivity. If the GMC Savana's exterior styling looks familiar, that may be because the basic box shape hasn't evolved much in 30 years. It's a van, after all, so the rolling breadbox shape is what is needed for the interior to be so roomy and versatile. Of course, there are some distinctions, such as the rounded corners, flush headlights and high taillights. Available door configurations include sliding or split swing-out passenger-side doors and GM-exclusive swing-out doors on the driver's side. Useful exterior accessories include a roof-mounted ladder rack, roof-rack cross-rail system and mudflaps. These are often work vehicles, remember, so the base specification is quite Spartan. 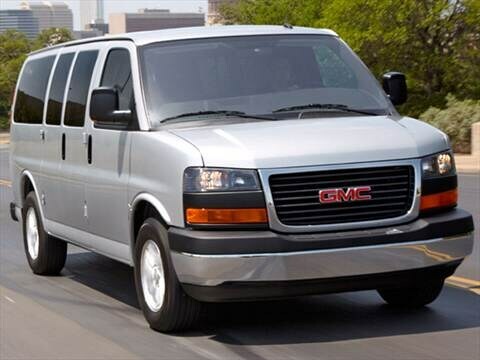 The 2013 GMC Savana Cargo Van starts with a V6 engine (4.3 liters, 195 horsepower), air conditioning, manual exterior mirrors, and vinyl upholstery and floor covering. The basic Passenger Van takes one step up with a 4.8-liter, 280-horsepower V8 and cloth seat fabric. Full instrumentation and a Driver Information Center (trip computer) are included across the line. Standard safety features include 4-wheel antilock disc brakes, StabiliTrak electronic stability control and dual front airbags (plus head/side-curtain airbags for the first three rows in the Passenger Van). Since standard fare is lean on the GMC Savana, the options list provides a lot of creature comforts and equipment upgrades. There's a selection of V8 engines (including the 6.6-liter Duramax turbodiesel), an all-wheel-drive system, a towing package, plus such items as cruise control, upgraded audio systems and power windows and locks. Also available are rear-area heating and air conditioning, leather-wrapped steering wheel and six months of OnStar "directions and connections." Note that the aftermarket offers all manner of specialty equipment, including tool racks and work benches and special-needs mobility provisions, and GM actively cooperates. With one V6 and five V8s on its roster, the 2013 GMC Savana offers buyers an engine for most any need. On the low end of the range is a 195-horsepower 6-cylinder mated to a 4-speed automatic transmission, which is suitable for light-duty applications but not heavy-duty hauling. For big burdens, the optional 6.6-liter turbocharged diesel V8 is hard to beat, with its massive 525 lb-ft of torque. Between those extremes are 4.8-, 5.3- and 6.0-liter gasoline V8s, and also a CNG (compressed natural gas) conversion for the 6.0 that includes hardened valve seats and a special 3-tank fuel-storage configuration. All of the Savana's 8-cylinder engines are paired with a 6-speed automatic transmission. The 2013 GMC Savana's Manufacturer's Suggested Retail Price (MSRP) starts at about $25,500. The standard 3500 Extended Passenger Van has an MSRP around $35,000 (not excessive for a flexible family vehicle) and a fully loaded Savana can top $50,000. The comparable E-Series Ford full-size vans don't offer the same broad range of choices and prices run in a narrower band between the Savana's highs and lows. A newcomer to the class is Nissan's NV – a pretty refined package but without the maximum hauling capacity or options choices – that prices out close to the Savana's lower-end numbers. For current information regarding what local consumers are paying for Savanas, make sure to check the Fair Purchase Price on KBB.com. Compared to the Ford E-Series, the GMC Savana (and its twin, the Chevrolet Express) is expected to maintain more of its value when trade-in time rolls around.